Bandlock 2 closures can be manufactured in sizes up to 90”, or larger depending on flow conditions. Computer-aided technology has played a large part in the design of the Bandlock 2 closure. Although robustly designed to primary pressure vessel code requirements, main pressure loaded sections have been engineered to save weight by employing finite element analytical techniques and proof tested by strain gauges. The fail-safe door uses a locking band mechanism which comprises a duplex stainless steel conical thrust ring fitted between the door and hub. It transmits the pressure load uniformly around the full 360° circumference of the hub and, even in the locked position, is always in compression and visible to the operator. Its unique self-energizing fully moulded lip seal energizes at zero pressure to give a completely pressure-tight seal and full vacuum capability. A double acting hinge mechanism further allows the door to be swung through 270° to ensure easy access. Bandlock 2 closures can be manufactured in sizes up to 90", or larger depending on flow conditions. They are also available in sizes up to 50" with flange connections for easy replacement of blind flanges. A wide range of standard configurations and options are complemented by the ability to customize the closure to exact application requirements. Hi-T Magalert units can be supplied with built-in battery power, data logging and a GSM alarm interface, making them ideal for remote locations. Their straightforward easy use and set up, further makes them ideal for use as re-locatable mobile devices. The Bandlock 2 closure range is complemented by pig signallers available with intrusive or non-intrusive technology. The ever-popular Hi-T Pigalert, with the assurance of a predictable mechanical trigger, is simple to install and operates and provides a reliable, robust signalling solution which is ideal for withstanding tough working environments. Non-intrusive pig detection offers the benefit of not requiring any holes in the pipe, maintaining best integrity and safety. 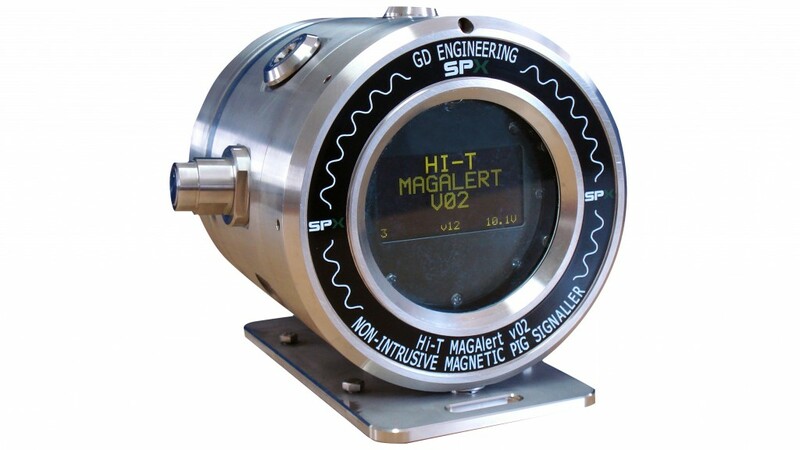 The GD Engineering Hi-T Magalert uses magnetic technology to detect, signal and log the passage of magnetic pigs at critical points along a pipeline. It is designed for straightforward easy use, requires no additional setup or maintenance tools and is ATEX compliant, housed within a fully certified aluminium or 316 stainless steel explosion proof housing suitable for use in Zone 1, Zone 2 group IIA, IIB and H2 Areas. Hi-T Magalert units can be supplied with built-in battery power, data logging and a GSM alarm interface, making them ideal for remote locations. Their straightforward easy use and set up, further makes them ideal for use as re-locatable mobile devices. Pig passages can also be signalled as they occur using ultra-bright LEDs, which are incorporated into the unit and are visible from up to 100m. Prior to clearing the history of events it is possible to connect the Hi-T Magalert signaller to a PC and download all stored data. The Hi-T Magalert is very quickly and easily attached to a pipeline using ratchet straps or stainless-steel bands. SPX FLOW also offers customised solutions for multiple pig launchers, to enable sequential pig launching operations to be performed remotely and without the need to depressurise the launcher. GD Engineering closures and pig signallers are well-established solutions within the oil and gas industry. The Bandlock 2 closure continues to be a leading closure solution with years of proven, reliable service. GD Engineering equipment solutions are supported by thorough validation testing; global, expert service capability, and a deep understanding of the technology and requirements of closures and pig signallers across the oil and gas industry.